Another instantly different as you cross the border experience. On our ferry there was a monk and a ladyboy. On land, the forests looked wilder, not the regular rows of plantation palms we had seen for much of Malaysia. People no longer wore motorbike helmets or their jackets on backwards as they zoomed around on mopeds. There were A LOT of pictures of the King. The alphabet is crazy and we were not totally clear how much a baht was, but the road was good and Satun seemed a friendly town. Most importantly, we found a motel with cable TV, to watch the mighty Imps play Burnley in the FA Cup. Two of whatever’s in there please. After a winning first dinner of pad Thai and banana rotis, we enjoyed watching the winning Imps and looking at some island options. Tiny Bulon Leh caught our eye, so we pedalled to Pak Bara for the ferry service. It was a scenic boat ride, with towering limestone stacks, blue sea and Bulon’s beautiful curve of white sand. 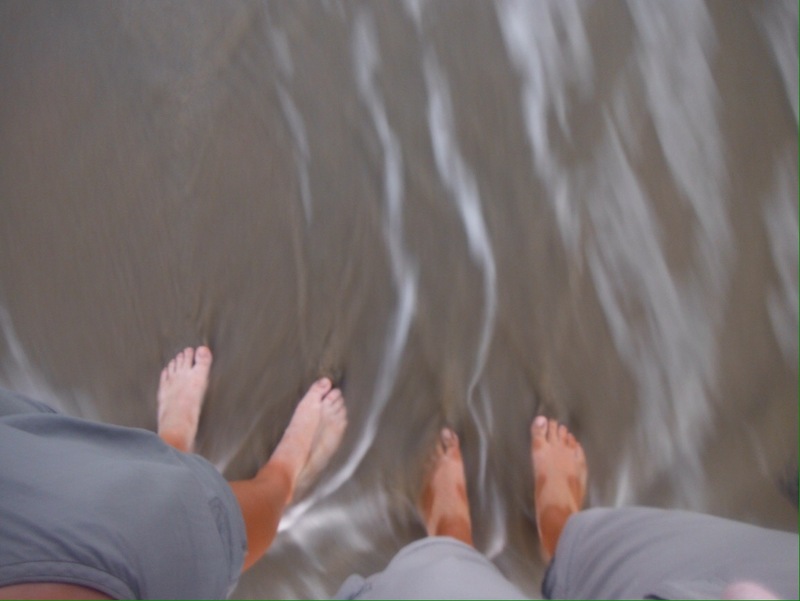 Getting on to the beach was a little trickier. 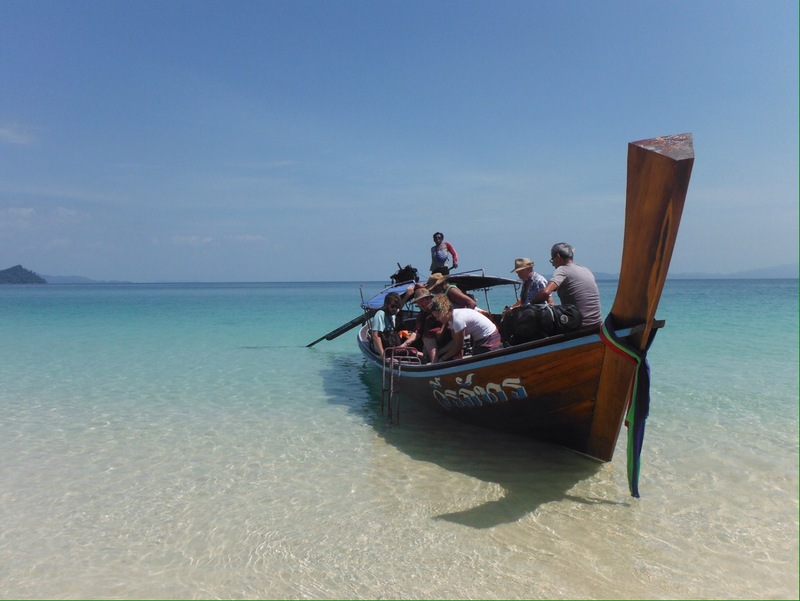 We had to transfer to a long tail boat (just like in every travel brochure picture of Thailand) to get from the speedboat to the sand. Getting the bikes off the long tail needed one person on the boat passing the bike to the other, stood in the sea, to carry above the water and up the beach. Two bikes and eight panniers took a few trips. We hadn’t booked any accommodation as we had heard that you could make a donation to the school and camp just back from the beach. This turned out to be true, so we put our tent in one of it’s best spots of the whole trip. There were a few downsides to camping, mainly the ants and the heat, but the location made up for the discomfort. 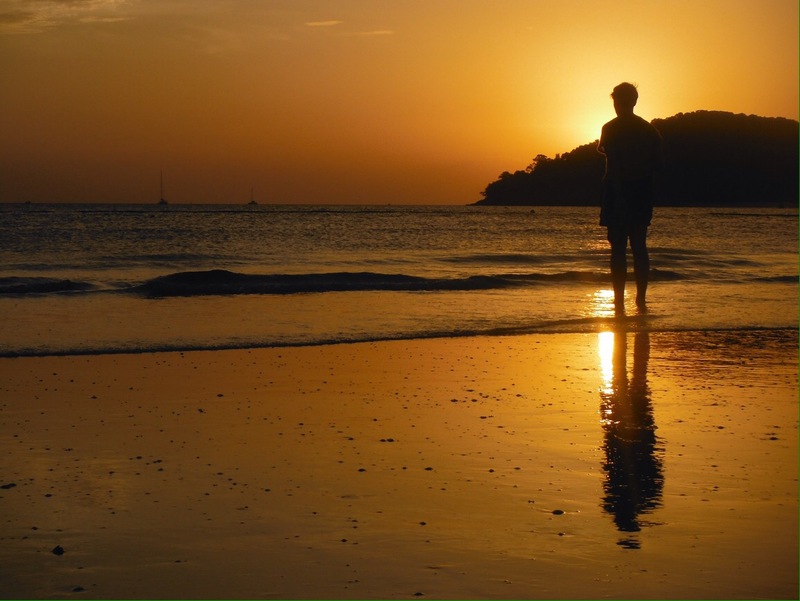 White sand, turquoise water, blue sky – like an episode of Death in Paradise without the ‘impossible’ murder, only four suspects and Ardal O Hanlon. (That’s right, we are fully up to date on all the big changes back home). Bulon is a great size for exploring and I would recommend a visit if you are in the area. 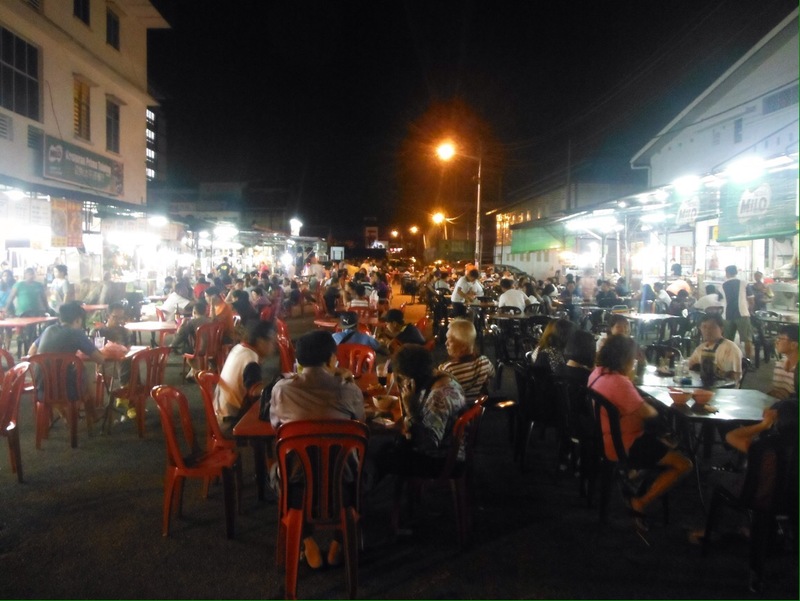 It’s small enough to walk all the ‘roads’ in a few hours, yet developed enough that there’s a good range of accommodation and choices for eating. We snorkelled, saw lots of fish, and circumnavigated the island by kayak, only getting a little bit seasick. 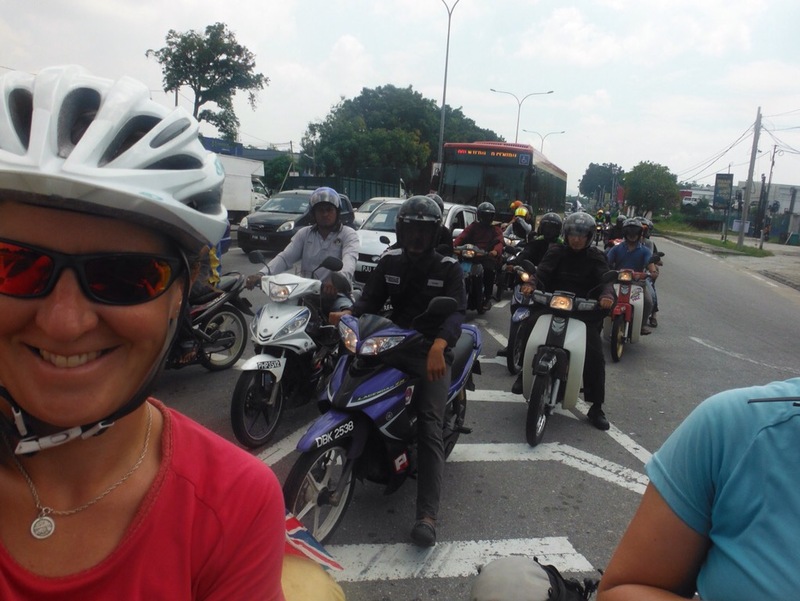 We also enjoyed hanging out with Andrew and Marcy, two cyclists we first met on a train in Kuala Lumpur. (They are on instagram @convenientlylocated where you can see some much better photos of some places we’ve been and lots more that we haven’t). Apart from the sweaty sleeping arrangements, it was like a real holiday. We escaped the port town and found a nice beach further south for dinner and sleeping. It was much busier here but brill to have a shower that wasn’t the sea and a room with fan still in earshot of the waves. 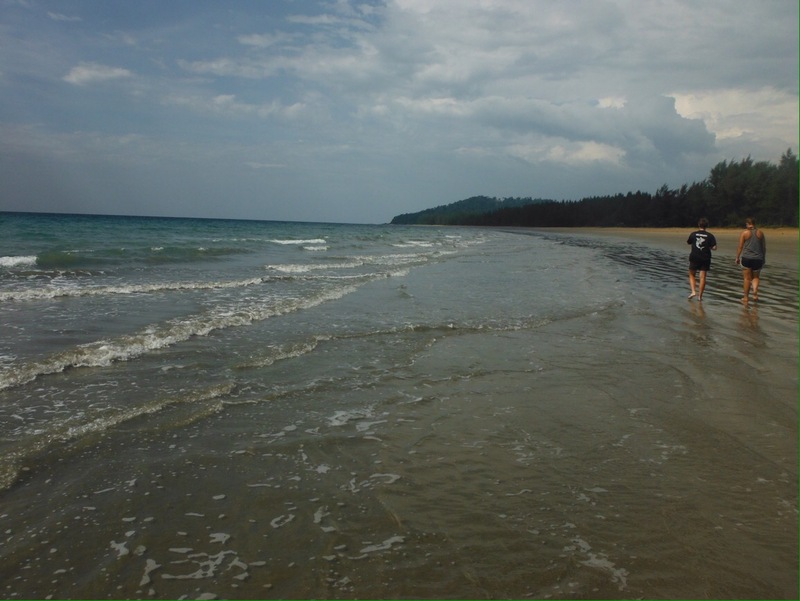 Refreshed, we spent four days riding to our next island mini-break, via Krabi, Phang-nga, Khao Lak and Khuraburi. 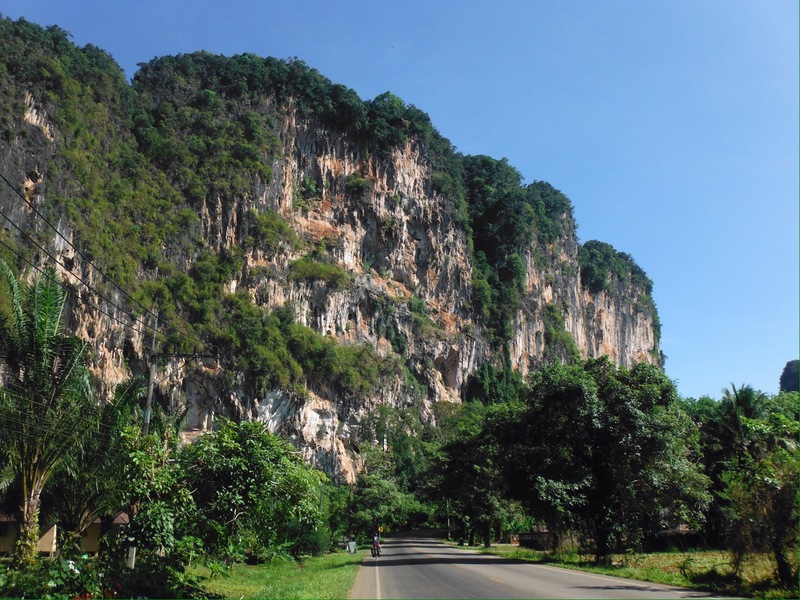 On the way there were some great little roads between limestone cliffs, villages with friendly people who thought we were nuts, mosques, temples, giant buddhas and all manner of other stuff to look at. We stopped regularly for fruit or iced tea or rice and vegetables. It was very hot. 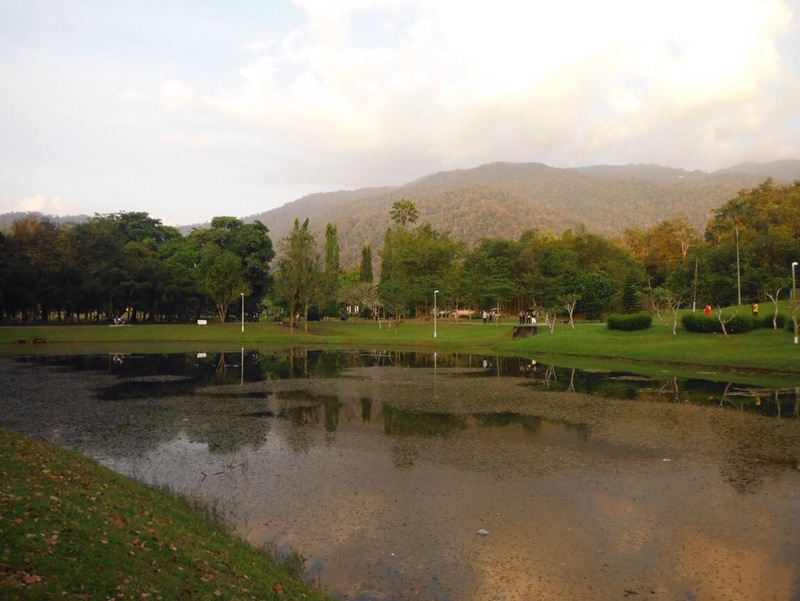 There was a bit of drag of touristic development along the Khao Lak coast. Imagine Skegness with tailored suits and massage instead of slot machines and chips. And a much better beach. 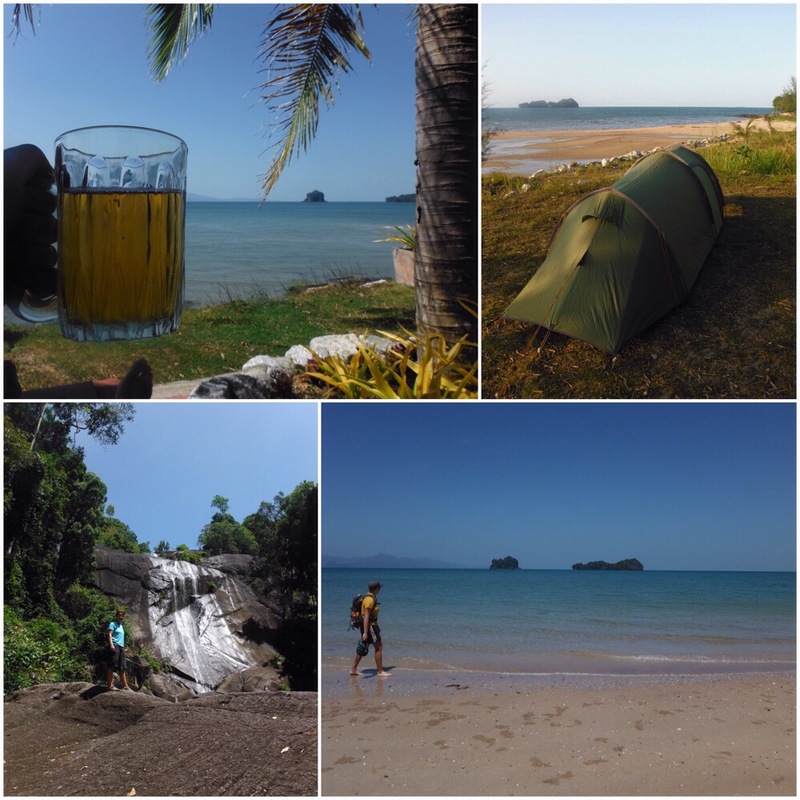 We weren’t sure where to stay, and ended up at a bar with camping on the most scenic of the beaches. 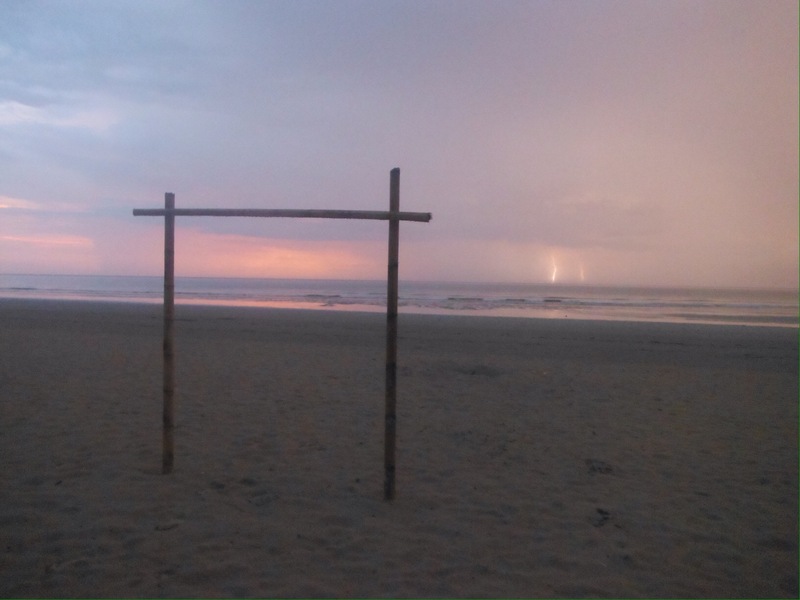 The downside was the ominously grey sky and thunder out at sea. The evening improved when my coconut shake arrived in a coconut. It then got even better when the bar staff said we could sleep on the massage platform so we didn’t have to put the tent up in the rain. We fell asleep to the sound of waves on what was essentially a school gym mat. 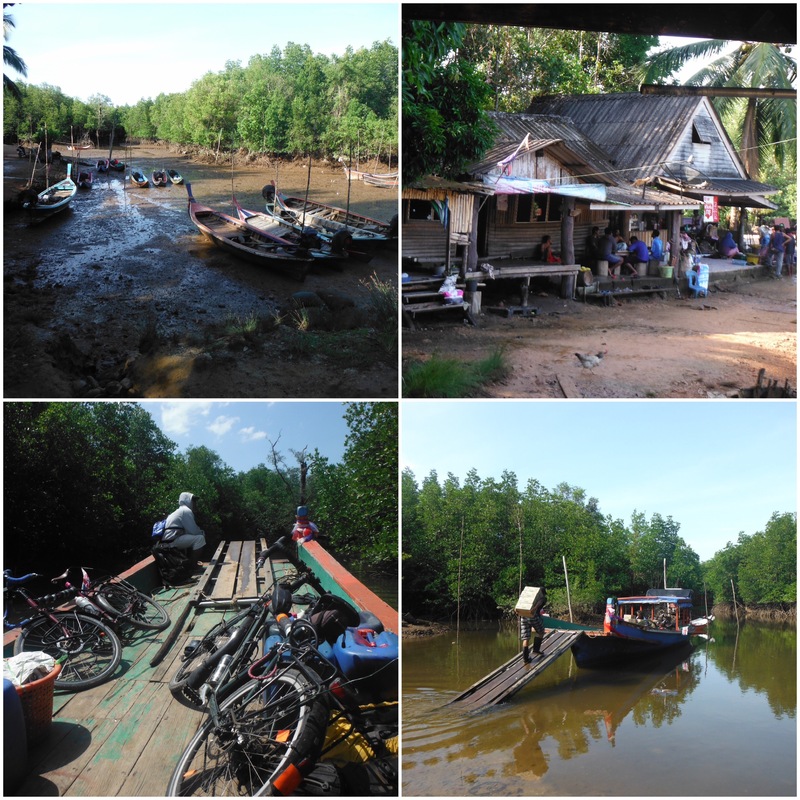 In Khuraburi we spent some time finding out how to get the boat Phra Tong, our next island. 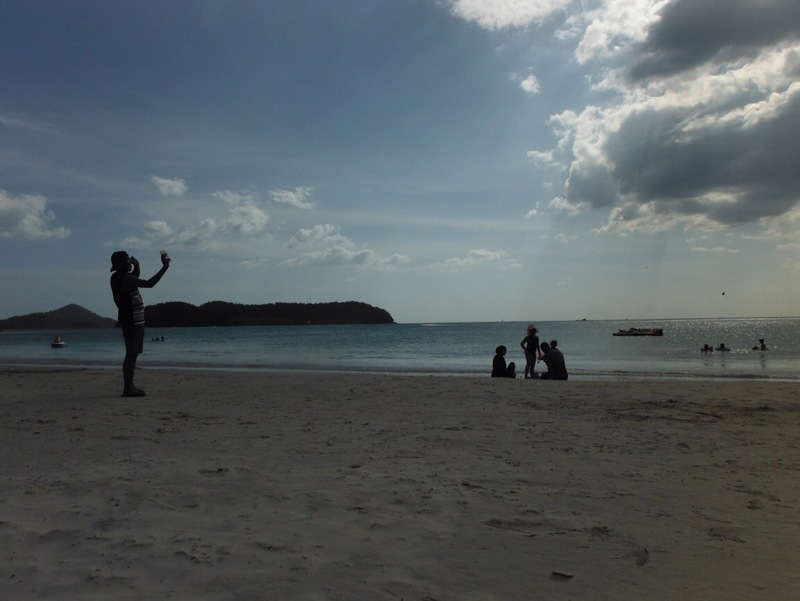 Excitingly, we would see someone we knew there, a good friend from university on her own Asia adventure. We were given some detailed directions and a hand drawn map. Our captain wandered around for a while, checking out a boat that was being built nearby, getting a snack, chatting to some fishermen. We wrote our diary, read some of our book, wondered about another trip to the breakfast place. All of a sudden, at 11:15, he pointed at us and the boat. It was time. Unlucky the three ladies who were coming back for twelve. We toured through mangroves and saw monkeys swinging around. On Phra Tong there didn’t seem to be a great deal. 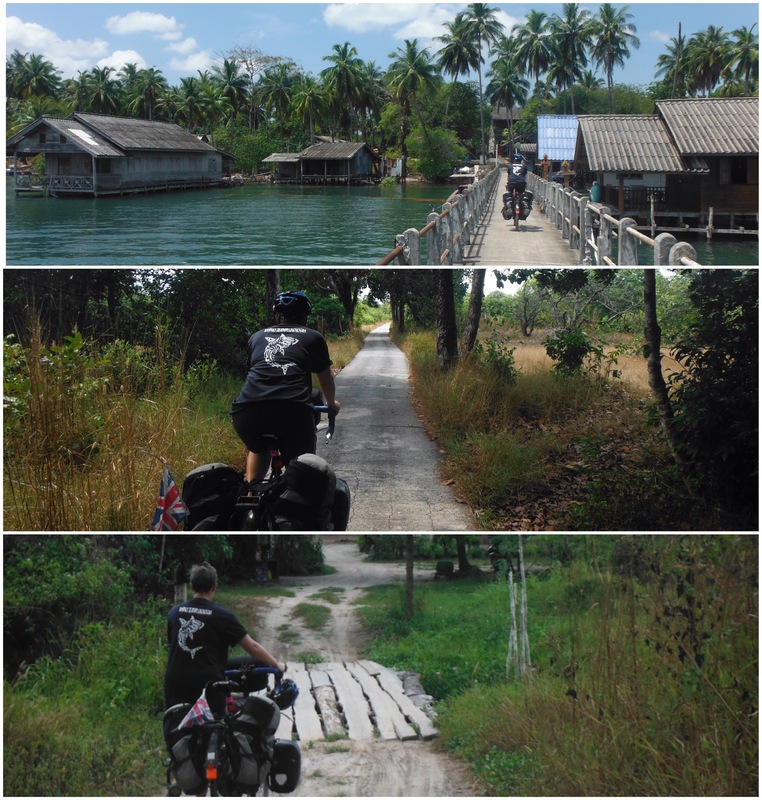 We found the road from the jetty village, not so tricky as it’s the only one on the island. It is concrete and just the width of a pick up. More mangroves, more monkeys. We rode for about 45 mins and saw one lady on a moped. There were no signs anywhere, our offline map helped us to identify that a sandy side track should take us to an area with a couple of accommodation options. We selected Mr Choi’s. He is quite the character should you be passing. Our bungalow was on stilts, the floor made of thin boards with big gaps between. Great for air circulation, rubbish if you drop something. Or several things. It was weird but awesome to walk down to the beach and find someone we knew. This was one of the least easily accessible places we have been on the trip, there was hardly anyone else there, yet one of them was someone we had known for many years. As with the rest of the country the tap water is not drinkable but 4g and wifi was excellent despite the sparsity of population. 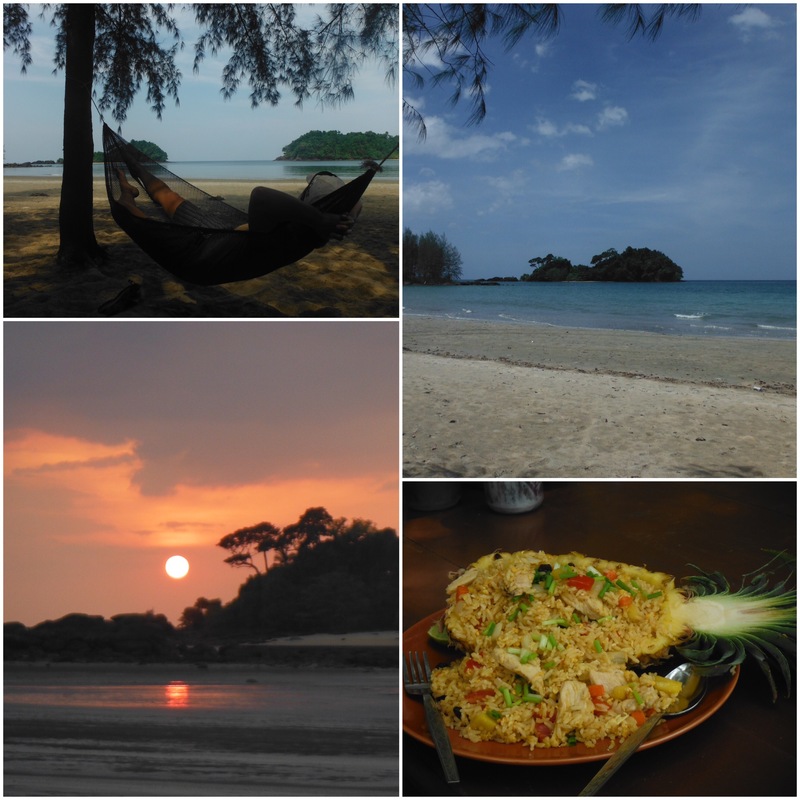 We spent four days walking the long, empty beaches, kayaking to other small islands, eating pineapple fried rice out of a pineapple, and laying in hammocks reading. Now this was a holiday. Even on the last night, when there was no electricity to our row of bungalows (usually running 6-11pm) because as Mr Choi explained, the generator was “kaput” and he had to choose between keeping the electricity for our row or the row with a family and baby in and “I choose baby of course”. The next morning we joined the kaput generator on Mr Choi’s boat for a private ride back to the mainland, to the real marina this time with other boats and everything. If the dream of an unbroken cycle to China by 2nd May (last entry date for our visa) was still on, it was time to stop lazing in hammocks and start pushing the pedals round. Fast. The other day we saw the sea for the last time in a long time. This will be the third major land crossing of the trip, and the biggest by far, after Netherlands to Italy (1 month) and Boston to Anacortes (3 months). Right now I’m not even sure where we will next find the sea. Best guess, visas allowing, it will be in St. Petersburg. Before the trip, it was never our intention to ride all the way across Asia. A long distance train was always part of the plan, and it is only every so often one of us says “Well, we could ride all the way…?” We could. For sure. Bangkok to London is less than half of the distance we have ridden so far. Google tells me I could walk it in 98 days. The thing, is I don’t really want to cycle it and neither does Jo. There are a few reasons for this, mainly time. China is extremely big. We would spend a long time riding there. This is not a life ambition, and doing something to say you’ve done it isn’t often a good motivation. We have reached a point in the trip where we have started to think about doing other things, like cycling LEJOG, going to an English pub, seeing live music, riding our fast road bikes, eating a roast dinner, going back to work (just me) and – most importantly – seeing our family and friends. 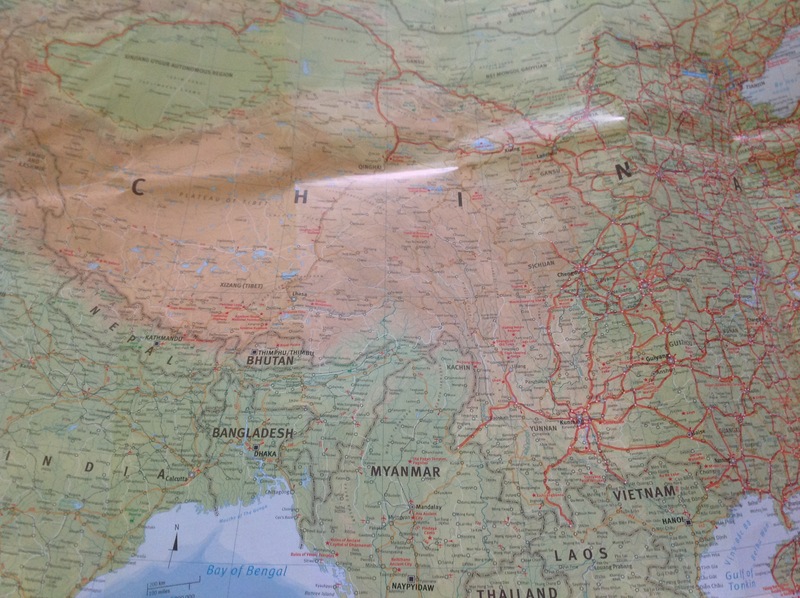 China: chuffing huge, 1 month visa. Those sums don’t work. I’m still excited about the next bit of pedalling. I’ve even spent some time today looking at a route in Southern China with some big mountain passes. It’ll be great to eat Chinese food. Though remember there they just it call it food, Friends fans. In the shorter term, we’ll visit Angkor Wat next week. Lucky people indeed. There are also still lots of places I’d like to cycle in the future. This probably isn’t the only long tour, though I suspect it will be the longest. Choosing to start going home has been easy. Choosing a route home is a bit more problematic. Visas are tricksy, especially as Jo has only a few clear pages in her passport. We really don’t want to fly so are page-saving where possible. Some visas have expiry dates (China by May 2nd, the race is on) and for some we need to have booked train tickets etc., but as yet have no idea of dates. Roughly, we’ll get trains from China to Russia via either Kazakhstan or Mongolia. From St Petersburg there’s a ferry to Helsinki. Helsinki to Hook van Holland is about 2500km with some ferries. We’ll be in Harwich eating fish and chips in no time. Or more likely, in July. Pedalling along, looking out for crazy stuff. With all this in mind there a lot of decisions flying around at the moment. It is hard not to see them all as super important trip changers. I think this happens at home too. Luckily, every so often the universe has a way of helping to put these things into context so you can concentrate on the ones that really are important. Like, when to cross the road in Bangkok traffic. THAT is important. 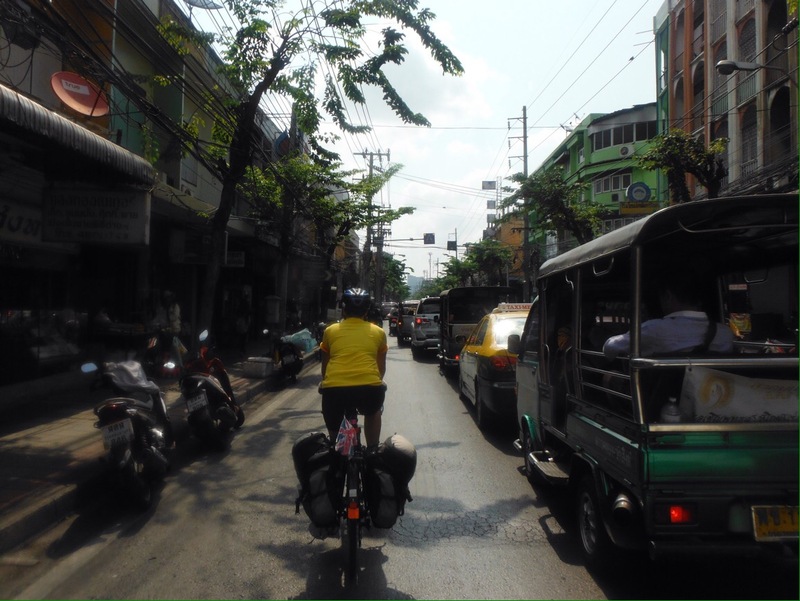 A slightly longer route to Vientiane? Probably not such a big deal. Stopping early one day because you see a nice beach? Definitely ok. It’s like sliding doors, you just get something else instead. Because we stopped early (3pm, not really that early, but we could have got one town further) the next morning was different, and it turned out to be brilliant different because we went to a Thai wedding with some Malaysian holidaying cyclists. If we’d ridden on, we would have missed it. Who knows though, if we had ridden on, there might have been a cake festival in the next town… So whatever route we go, it will be great trip home. I still love riding my bike every day and seeing new and awesome stuff. I’m just starting to get a feeling of needing to contribute more than instagram pictures to the people who are important. 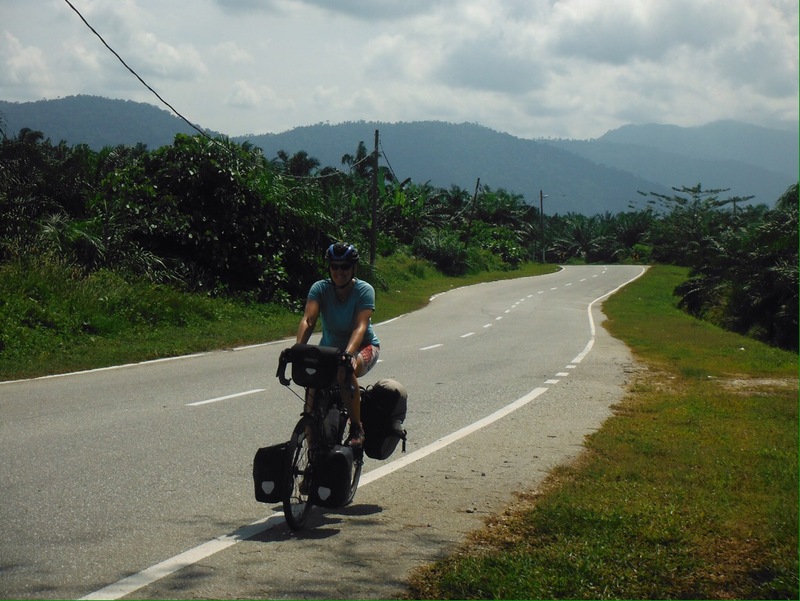 For us, the cycle touring lifestyle has an expiry date. It’s not even about the home comforts, though I can’t deny it will be delightful to make tea with real milk from a fridge and I absolutely cannot wait to turn the tap on and drink the water that comes out of it. See you in July UK! Saving the world, one plastic bottle at a time. Race you to the tap in Helsinki. Riding North through Malaysia we didn’t have much of a plan other than to stay near the coast and to go to some islands. 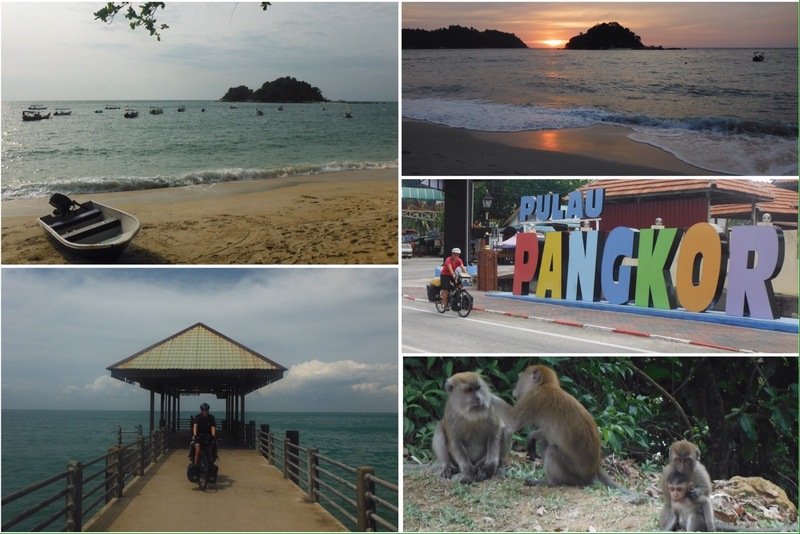 Penang and Langkawi are the well known Malaysian islands on this coast but our first island stop was Pulau Pangkor, described as “where Malaysians go on holiday at the weekend”, so on a Wednesday we thought this might be a good bet for some quiet beaches. 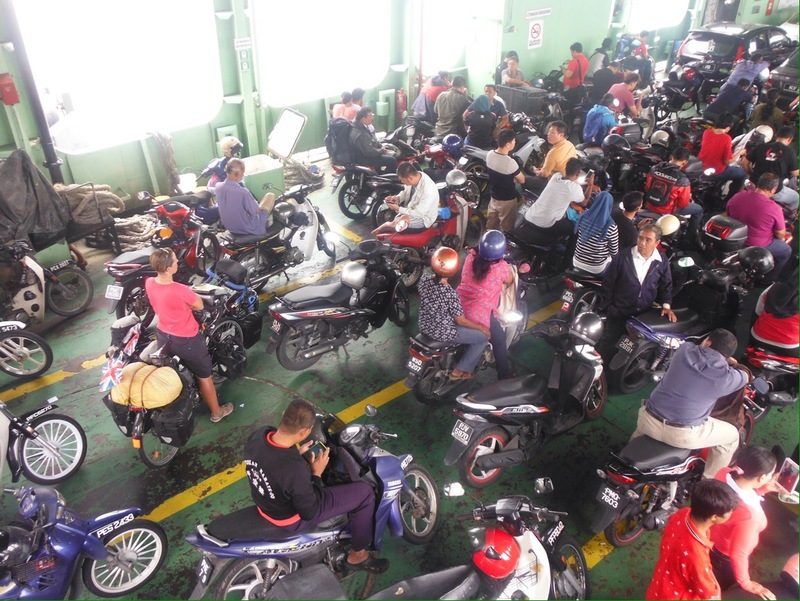 We got to the ferry port in Lumut at mid afternoon and got the what was to become normal look from boat staff when we turn up with the loaded bikes to take them on a ferry. 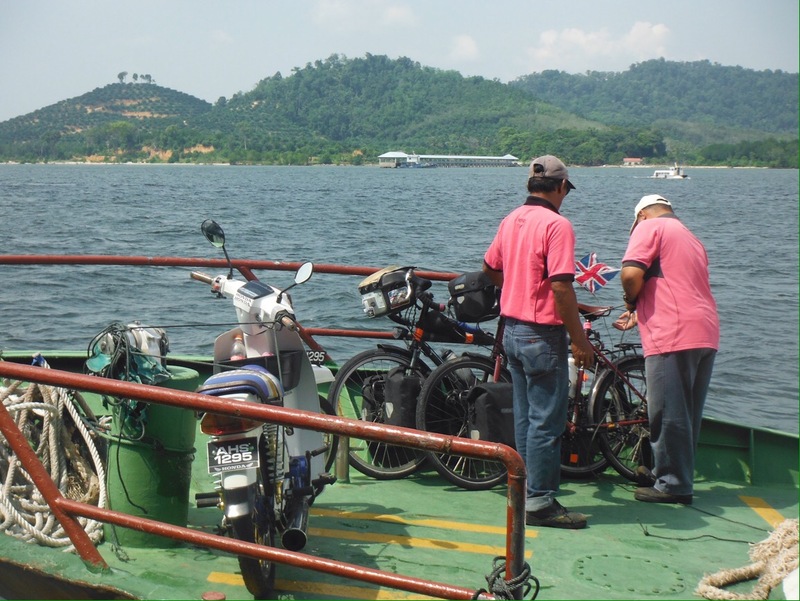 It’s a look that is a mixture of “what on earth are you crazy white people doing with bikes” and “challenge!” This is a foot passenger ferry, and there is obviously no bike storage area, so a bit of imagination is required for getting the bikes on and stowed. We have since learnt that the key in this situation is not to watch the precarious loading of the bikes. On this occasion they were pretty good as there was also the odd moped to carry. A short ferry ride later we were on our first South East Asian island. The port town was fairly busy with mopeds buzzing around everywhere but as soon as we got out of there the roads emptied out and there was nobody about. We had to ride up our first serious hills (>10%) which made us nearly melt. We were aiming for a small resort on the west coast with budget accommodation and there were so few people around we could name our price for a room steps from the beach. 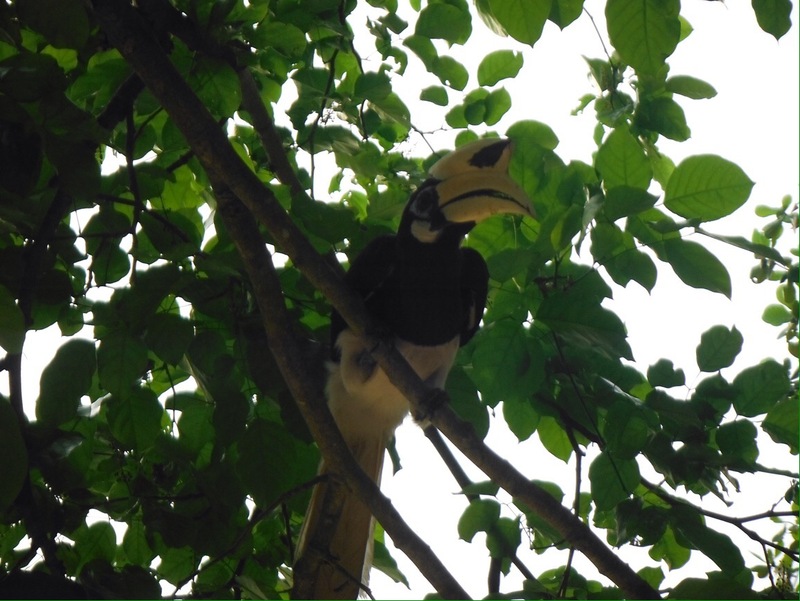 That evening we had dinner overlooking the sea, watched closely by a hornbill (it felt like being on the Lion King). There was a decent sunset as we were facing west and walking up and down a near empty beach (just us and a few hundred washed up plastic bottles, sadly) we were pretty happy with ourselves. The next morning the place was even quieter. There was nowhere open for breakfast and even the mopeds had thinned out. I sent Debs into a hotel to ask if there was something going on that everyone was at but no, it was just midweek on Pulau Pangkor. An afternoon ferry got us back to the mainland and we spent the evening in the fairly nice “resort town” (but we were still the only white people) of Lumut. From there it was a few days ride inland to Penang. 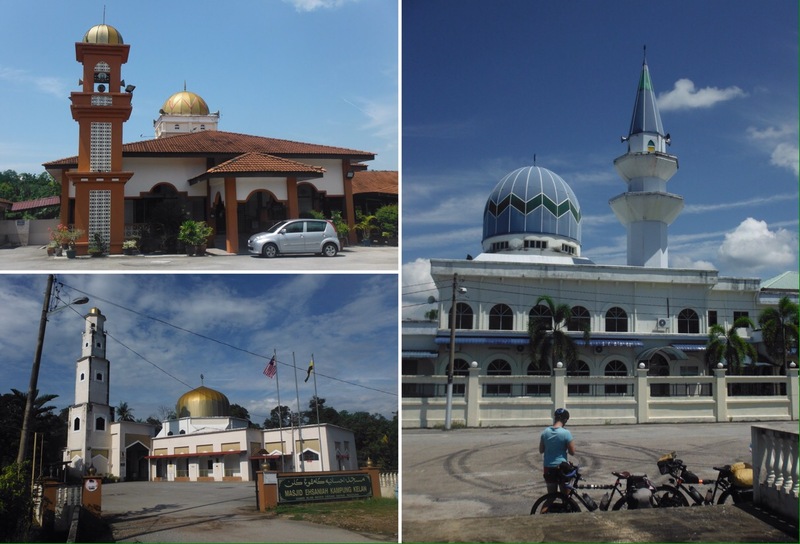 First stop was Taiping, a decent sized city famous for having 61 ‘firsts’ in Malaysia – first newspaper, railway station, prison, museum…. 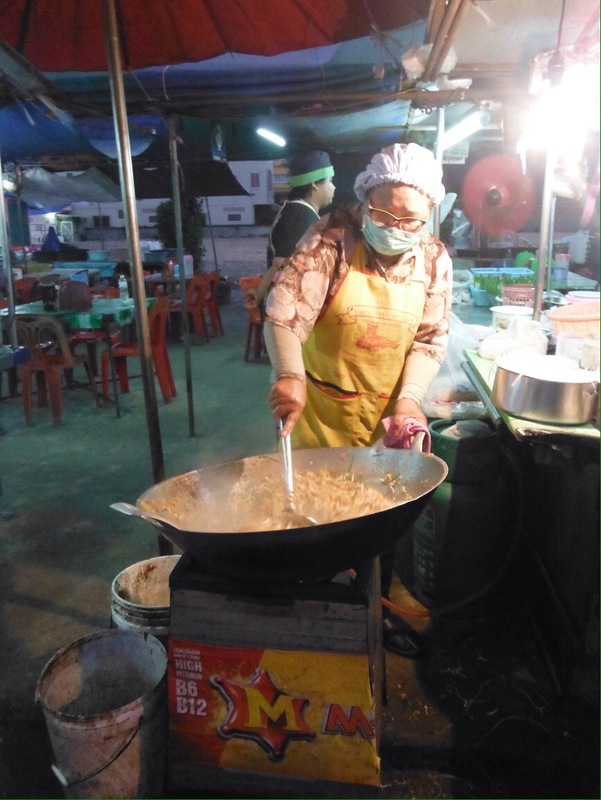 for us it was our first experience of eating at an outdoor market and the food and atmosphere set the bar high. It also had some nice lake gardens, overall a nice stop off and totally off the tourist trail. That day was mostly memorable for our closest brush with fame yet. We are getting quite used to people wanting to take selfies with us (we always wonder how these photos are explained to their friends. How we imagine it: “I saw these two amazing women today, they were on bikes carrying all of their stuff, how incredible is that? They had really muscly legs and didn’t even look tired!”. What probably happens: “I saw the weirdest thing today! Two white women riding bikes wearing strange hats, they were so pink and sweaty they looked like they were about to collapse, where on earth were they going? They must be mental! I had to take a photo!”) but this was a new high. We had stopped for cendol (will be explained in a future food-related post) and were about to leave when a bus load of middle aged women and children got off. Pleased we’d timed it to avoid the queue, I went to get my bike and noticed Debs being mobbed/hugged. Not wanting to miss out I went over to see what was happening and all of a sudden we were swamped with selfie requests, the women pushing and shoving to get their turn to take a selfie with the weird (amazing?) cyclists. We rode off smiling and wondering how this interaction would be explained to the husbands later. Anyway back to the cycling. 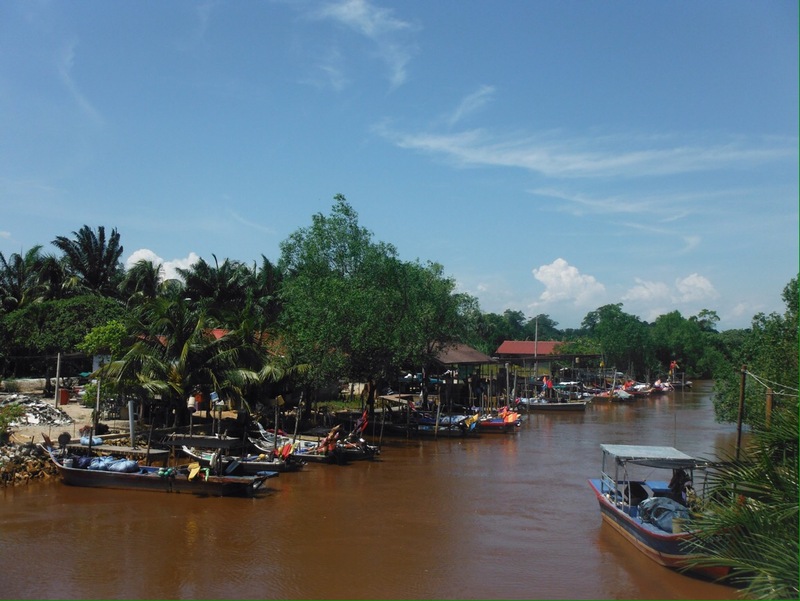 From Taiping we followed some small roads for a while which was a nice change but soon we were back on busy highways. We stopped for an ice cream at a petrol station (our new favourite air conditioned break) and a pump attendant looked over our bikes for ages, before giving the tyres a squeeze (why does everyone do this?) and insisting we needed them shining. We didn’t. That evening we were staying with a warm showers host and stopped in his town to buy some fruit. I walked back from the fruit shop to find Debs chatting to Wendy, who had good English and insisted we came to her shop to meet her family. Sure we said, they were all so excited to meet us, we ate pomelo for the first time and there was much hilarity over the fact that I couldn’t peel it (being a failure is funny in any language it seems). Wendy was excited to have “real life white people” in her shop, we were excited to be invited in, generally there was much excitement. Wendy said to me “your eyes are so blue”, I hadn’t really thought about how strange blue eyes look here. We were asked to stay for dinner but had a host to get to (bad timing, we never usually do) and we spent the evening with David and his wife who cooked us a great curry (they were Indian-Malay). He had cycled in England and the USA. Our favourite story was how he went into a shop to buy bread, they asked what kind of bread, he said he didn’t know, just bread, they showed him a list of breads, he chose one, then they kept asking what he wanted in it, “there were all these raw vegetables, do you want cheese? I just wanted bread”, and we realised he had walked into a Subway. It must be quite confusing in there when you only want bread. The chucking-a-mandarin-in-a-bucket ceremony. 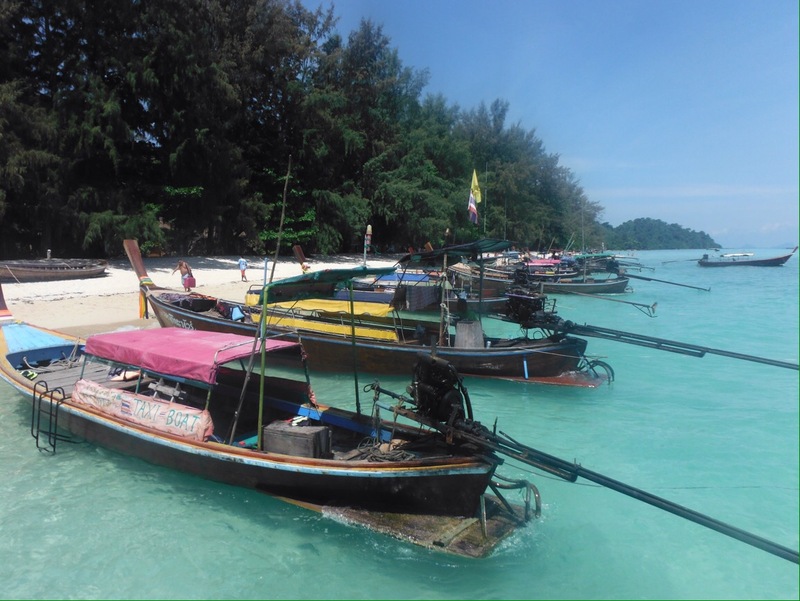 Nearly as many mandarins in the sea as plastic bottles…. 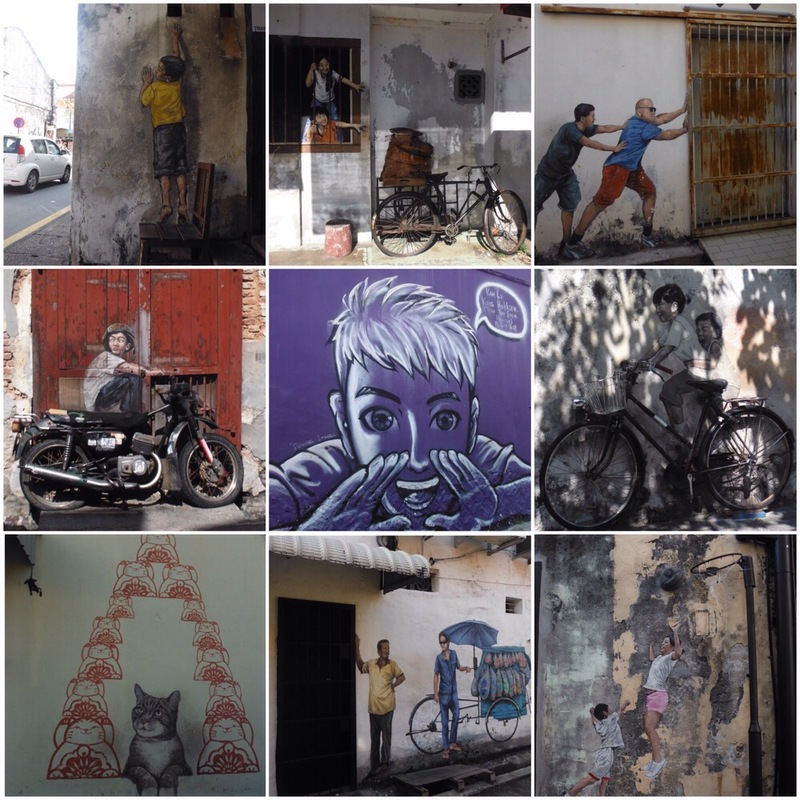 There’s some cool street art in Penang and lots of old fancy colonial buildings as well as the usual mix of churches, mosques and temples. It kept us busy but our main reason for staying so long was to get visas for Thailand, as currently 60 day visas are free and we were worried about only getting 15 days at the border. On our way back from the Thai embassy we saw our fourth crash in Malaysia, a motorbike going straight into the back of a car, flipping up and throwing the driver onto the ground on his head. We stopped and helped collect his belongings from the road as he dragged himself to the side. The amount of crashes we are seeing here, either happening in front of us or riding past the aftermath of ambulances and upturned vehicles is quite frightening and a reminder that we are at the mercy of other drivers and anybody can be in the wrong place at the wrong time. We just cross our fingers that it won’t be us and keep our wits about us. 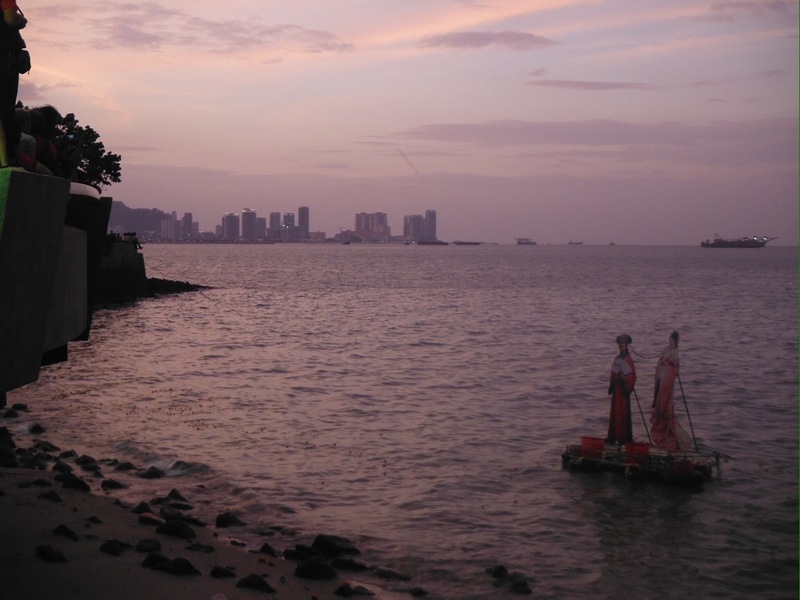 One day in Penang was filled with risking public transport to visit a hill-top temple with a huge statue and a good view of the city. 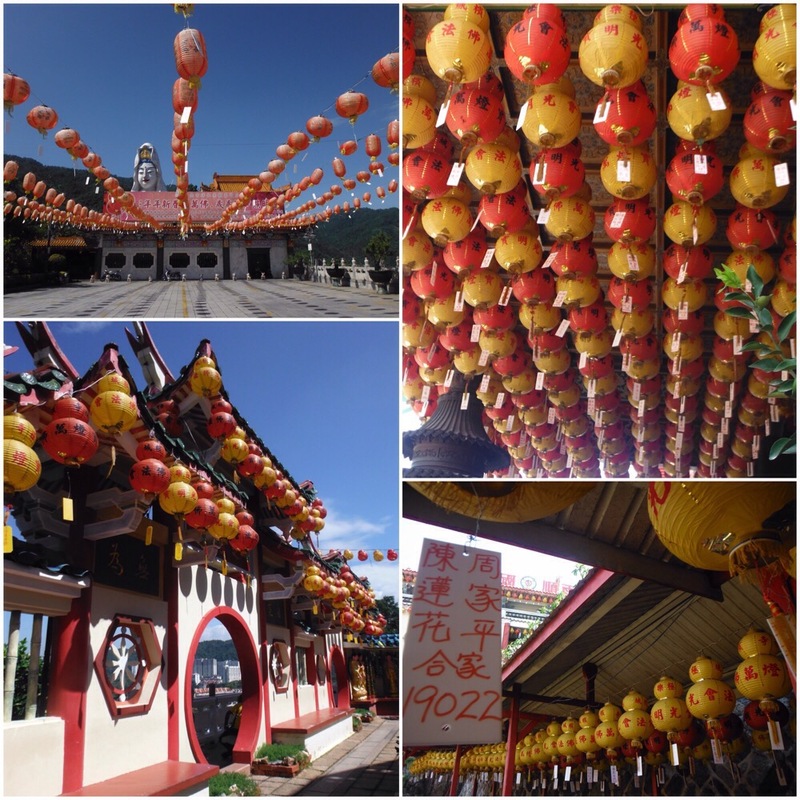 Despite Chinese New Year finally being over the temple was decorated with more lanterns than I ever thought possible. Just as I was wondering how many lanterns it takes to decorate somewhere like that I saw that some had numbered tags – 19,000 and counting. That’s a lot of lanterns. Someone makes a killing selling these once a year. It was all very colourful. The bus ride back was eventful, our female driver wore a headscarf and aviators and spent the whole time on her two phones. We clung on for dear life and wondered whether it was better to be cycling or on public transport. Not sure. Instead of going back to the mainland and riding north we could take a three hour ferry straight to Langkawi, our final stop in Malaysia. This is another popular tourist stop but more for the beaches than the towns. Again we tried not to watch as our bikes were lifted onto the top of the ferry and had a very unpleasant ride as we had to sit downstairs airline-style, could hardly see out of the windows and definitely couldn’t go out on deck for some fresh air or enjoy the scenery. 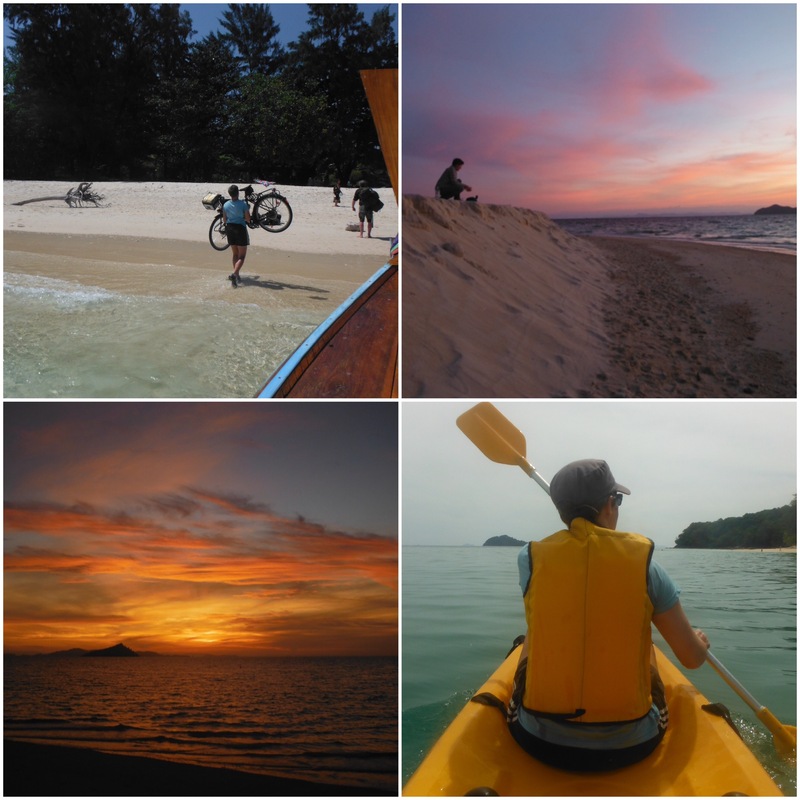 Langkawi was also fairly disappointing at first glance, hotels and tour agencies everywhere, and riding round to Pantai Cenang, the main resort, we were sad to see it look more like Benidorm. The beach was nice but full of bars, sun loungers, jet ski operators, people selling boat tours and backpackers taking selfies. We treated ourselves to a beer on the beach (being a largely Muslim country, alcohol is heavily taxed in Malaysia – it would cost us more to buy one beer than a huge meal for both of us – but Langkawi is duty-free) and found a quiet spot at the end of the beach to watch the sun set but we weren’t tempted to stick around and rode off the next day to find a quieter beach on the north of the island. This was achieved successfully, we found a lovely motel right on a quiet beach where you could also camp. After one air-conditioned night we tried out sleeping in the tent for the first time since New Zealand. Despite a cool breeze outside it was like trying to sleep in a sauna and we both laid in a pool of our own sweat trying to sleep. It finally cooled off about 5am and we had a couple of hours until the sun was up. Camping was not something we would be making a habit of. We were sad to leave Malaysia. 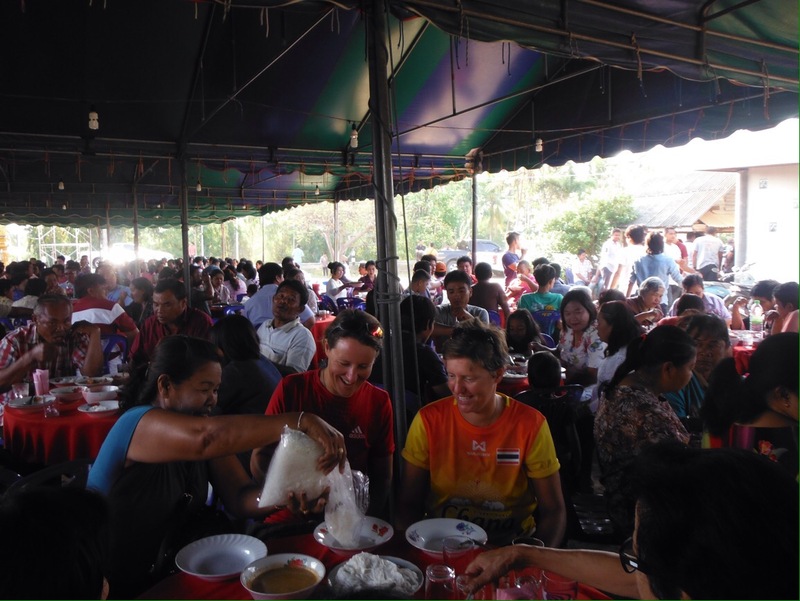 We had enjoyed the food a lot, everybody speaks English well and it’s an easy place to travel around. We had learnt what we needed to get by on a bike – key words for survival (water, danger, ice cream, fried), how to find decent cheap accommodation, what and where to eat, getting drinking water, what to expect from towns, how much things should cost… I always find it quite unnerving to have to enter a new country and start all of this again.